This is the suppressor you need for your USMC M40A5 build. 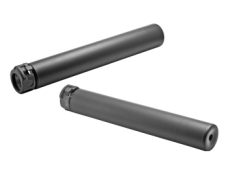 The FA762SS sound suppressor features a barrel overlap design that adds just 5.5 inches to the original length of your AR-10, Bushmaster A2 and A3, M1A, M14, or other semi-auto or bolt action rifle while providing superior sound suppression. The extra-tight suppressor bore is especially suited for sniper rifles. The overlap design requires at least 2.75" of clear barrel with a maximum diameter of .775", measured from the muzzle rearward. Rifles with larger diameter barrels may use the FA762MG sound suppressor. All SureFire sound suppressors require an adapter for attachment to a firearm. Adapters for the FA762SS sound suppressor screw directly onto the original rifle muzzle threads—see Parts and Accessories below.